This paper describes a new, simple and sensitive catalytic kinetic spectrophotometric method for the determination of total polyphenols in white wines. The method was based on the catalytic effect of Cu(II) on the oxidation of phenolic compounds by H2O2 in acid media. The reaction was followed spectrophotometrically by measuring the increase in absorbance of oxidation products at 420 nm. Under optimal experimental conditions, a differential variation of the tangent method was used to obtain a calibration curve over the range of 23.01-194.11 μg mL-1 of phenols. The calculated detection limit (3.3S0/b) was 6.77 μg mL-1 for ten replicate measurements of blank signal. The relative standard deviations for five replicate determinations on 70.0, and 170.0 μg mL-1 of galic acid were 2.49 and 1.79 %, respectively. The proposed method was successfully applied for the determination of total polyphenols in white wine samples and the results were in excellent agreement with the Folin-Ciocalteau method. Keywords: Kinetic-spectrophotometric method, phenolics oxidation, white wine. A kinetic spectrophotometric method having excellent sensitivity, sufficient accuracy, simple procedures and the necessity of less expensive apparatus is more attractive for trace metals,6-8anions9 and organic compounds6,10 in food, water and biological samples. Their sensitivity is at least 2-3 orders of magnitude higher than that of ordinary spectrophotometric methods. Spectrophotometric measurements were performed on UV-Vis spectrophotometer, model 8453 (Agilent, Germany) with a 1 cm match glass cell. For the pH measurements, Radiometer PHM 29Bb pH metre, (MeterLab, USA) and a combined glass-calomel electrode, GK2311C, were used. All solutions were kept in a thermostatic water-bath, model MP-5A, (Julabo, USA) at 25 1 0.1 0C before the beginning of the reaction. High precision measuring for laboratory applications were performed by using an analytical balance (10.0001 g), model AB204-5, (Mettler Toledo, Switzerland). A stopwatch was used to record the reaction time. Analytical grade chemicals and deionized water (MicroMed high purity water system, TKA Wasseraufbereitungssysteme GmbH) were used for the preparation of all solutions. All the stock solutions were stored in polyethylene containers. All the polyethylene containers and the glassware used were cleaned in aqueous HCl (1:1) and then thoroughly rinsed with deionized water. A 1.000 g dm-3 Cu(II) (nitrate salt, Merck, KGaA, Darmstadt, Germany) was used as a stock solution. Cu(II) working solutions were made by suitable dilutions of the stock solution. A solution of GA (gallic acid), Sigma-Aldrich (St. Louis, MO) of 1.000 g dm-3 was prepared by weighing 0.0500 g of substance of analytical grade, using an analytical balance, and dissolved with deionized water in a calibrated volumetric flask of 50 mL. A 1.0 mol dm-3 solution of hydrogen peroxide (Merck) was prepared by an appropriate dilution of 30 % of reagent in volumetric flask of 50 mL with deionized water. A 0.10 mol dm-3 tartaric acid stock solution was subsequently prepared by dissolving 1.50 g of C4H6O6 (Merck) in water and diluting to 100 mL in a volumetric flask. The reaction was carried out as follows. In a special four-compartment vessel (Budarin's vessel), the solution of Cu(II) was placed in the first, solution H2O2 in the second, white wine in the third, and tartaric acid (pH = 3.5) and deionized water (total volume 10 mL) in the fourth compartment. The vessel was thermostatted for 5 min at 25 1 0.1 0C. The contents were mixed during 60 s and then immediately transferred to the spectrophotometric cell with a part length of 1 cm. The change in absorbance was recorded at 420 nm as a function of time every 5 min for the first 40 min of the reaction. The rate of the reaction at different concentrations of each of the reactants was obtained by measuring the slope of the linear part of the kinetic curves to the absorbance plot (from Beers low A = , dc/dt = , slope = dA/dt, rate = dc/dt). 0.50 mL standard solution of Cu(II) (0.001 mol L1) were pipetted into the first compartment, 0.50 mL of the solution of H2O2 in the second, 3 mL of white wine in the third, and tartaric acid (pH = 3.5) and deionized water (total volume 10 mL) in the fourth compartment of Budarin's vessel. After that, four more vessels in which different volumes of H2O2 solution was added to the first compartment of each (0.75, 1.00, 1.25 or 1.50 mL), while the volume of the other solutions in the rest of the compartments was kept constant. 0.50 mL white wine and standard solution of gallic acid were pipetted into the first compartment, 0.50 mL the solution of H2O2 in the second, 0.5 mL of Cu(II) in the third, and tartaric acid (pH = 3.5) and deionized water (total volume 10 mL) in the fourth compartment of Budarin's vessel. After that, four more vessels in which different volumes of H2O2 solution was added to the first compartment of each (1.00, 2.00, 3.00 or 4.00 mL), while the volume of the other solutions in the rest of the compartments was kept constant. In order to asses the precision and accuracy of the proposed method, the reaction rates were determined for five replicate determinations and the results are presented in Tables 1 and 2. The method was also applied for the determination of total phenols in white wines. The results are summarized in Table 3.
where Ccu = total concentration of copper, and K1 and Kn = new constants. The catalytic effect of Cu(ii) on the oxidation of phenolics in white wine by hydrogen peroxide in acetic media (pH = 3.5) was observed (Fig. 2). Absorbance measurements have been performed at the wavelength of the absorption maximum of oxidation products at 420 nm, at pH of 3.5 and at 25 1 0.1 0C. In order to establish the optimum conditions for the content analysis of phenolics in white wine, the influence of the reaction variables was studied for catalytic reaction. The dependence of the reaction rate on the concentration of H2O2 was investigated in the range 0.10-0.29 mol dm-3 (Fig. 3). The reaction rate increased with increasing the concentration of H2O2. 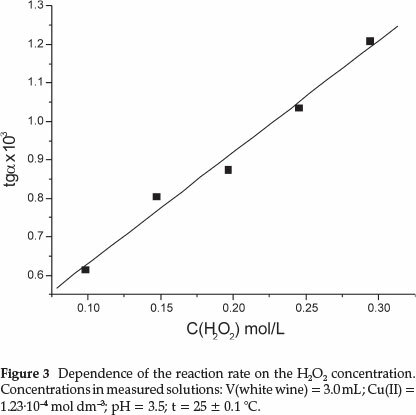 The analysis of this figure shows that the oxidation of phenolics in white wine follows pseudo-first order reaction kinetics with respect to H2O2 concentrations because the curve is linear. The H2O2 concentration of 0.10 mol dm-3 was selected, because at concentrations higher than 0.10 mol dm-3 the rate of the reaction became too fast, and was therefore not suitable for kinetic determinations. 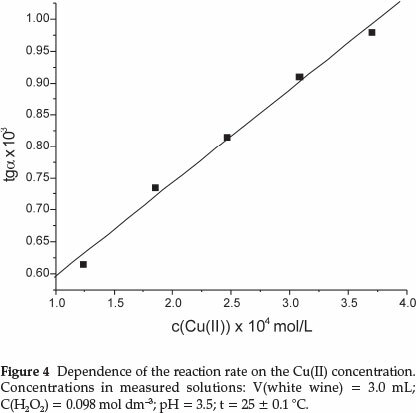 The dependence of reaction rate on the concentration of Cu(II) was investigated over the range from 1.23-10-4 to 3.70-10-4 mol dm-3 (Fig. 4). The reaction rate is of pseudo-first order with respect to Cu(II) concentration. The Cu(II) concentration of 1.232-10-4 mol dm-3 was selected, because at higher concentrations the linear part of the kinetic curve (A-t) is rather short. The influence of temperature on the reaction rate was studied in the range 25-40 0C. The reaction rate increased as the temperature increased. However, although higher sensitivity could be obtained at a higher reaction temperature, it was troublesome to control the temperature precisely at the evaluated temperature. A reaction temperature of 25 0C was chosen. The calibration graph has been constructed under the following working conditions: cH O = 0.10 mol dm-3; cCu(H) = 1.23-10-4 mol dm-3; pH = 3.5; t = 251 0.1 0C;l = 420 nm. Under these conditions the change in the reaction rate was quite reproducible, offering an additional routine quality control application in laboratories. The limit of detection (LOD) and the limit of quantification (LOQ) were calculated from the calibration graph as kSo/b, where k = 3.3 for LOD and 10 for LOQ, So is the standard deviation of the intercept and b is the slope of the calibration graph. LOD and LOQ are 6.77 and 20.51 μ-g mL-1, respectively. The precision of the method was determined by consecutive analysis of white wine sample and white wine sample of the same volume, but spiked with different concentration of gallic acid. For each concentration, the average tga determined (n = 5), the standard deviation and relative standard deviation (RSD) were calculated (Table 1). The precision validation indicates that this kinetic-spectrophotometric method is suitable for polyphenols determination in white wine under the kinetic conditions described. The accuracy of the method was measured as the agreement between the measured and the true value (found concentration and added concentration). By comparingthe found to the added concentrations, relative error (RE, %) was calculated for the determination of polyphenols (Table 2). To evaluate the proposed kinetic method, the amounts of phenolics in white wine samples were determined. The results are presented in Table 3. The results of the proposed kinetic method have shown good agreement with the results obtained by Folin-Ciocalteau method19. The student's i- and F-values (Table 3) at 95 % confidence level did not exceed the tabulated i- and F-values, confirming no significant differences between the kinetic-spectrophotometric method and the reference method. This work present development and application of a rapid, simple, low-cost and sensitive kinetic method for the determination of total polyphenols. The proposed method was applied to white wine samples. Validation was made by determination of linearity, accuracy, precision of the methods for the total polyphenols determinations in white wine. The results were compared with results obtained by using reference Folin-Ciocalteau method. The i-values and F-values, confirming no significant differences between the proposed an the reference method. The method has advantage in view of its sensitivity, low-cost, easy aviable chemicals and instrumentation, simple and direct application to white wine samples. This work was supported by the Serbian Ministry of Education and Science Protection (grant number 174007).